We’ve passed the winter resting phase where the work doesn’t necessarily slow down, but is way more in our control. Paperwork, record-keeping, seed orders, marketing plans, and budgets all need to be finalized in the months of December, January and February (not to mention a myriad of projects we saved for the “slower winter months”) but all those things can be scheduled around time with family and friends. They’re the rare farm tasks that don’t care one bit about what the weather outside looks like. Then later in the year, the months of May through November are pure chaos with planting, harvesting and weeding practically daily, but at least we have a routine. We know when we have to do certain things and there just isn’t much variability. It becomes clear what we can yes and what we can say no too. But March and April are just so weird. We’re tending to our greenhouse and (new!) germination chamber which really limits how far and how long we can be away from the farm. The cloud cover also dramatically affects things. A surprise sunny day when we’re halfway across the state could bring utter devastation to a hot box of growing plants. There is a ton to do this time of year but it’s all sort of non-urgent yet vitally important. It’s not a bad place to be in generally. It means we’re doing things right that we have a laundry list of things to get done pre-crazy to make our chaotic summer lives easier. But it is nearly impossible to make solid plans that involve driving to visit families a couple hours from the farm. So Easter really needs to come to us or move to a different time of year altogether. That’s what I’m finally realizing after six years of this wacky life as a farmer. For some reason or another, Easter still remains a holiday I never want to ignore. To me it feels like the welcome celebration of spring and that means so much to me as a vegetable producer. I want to celebrate warmth and sun and flowers and the start of a new growing season. So for the past few years we have celebrated our own little Easter close to home by ourselves wrapped in a blanket of nourishing simplicity as we tend to farm tasks. Last year we went to Cow & Quince for Easter brunch. It was bright and colorful and absolutely perfect, but this year I wanted to keep things even more simple. I wanted to enjoy one of our favorite indulgences: a decadent cheeseboard. The cheeses on this board were selected by my dear friend Shannon of Fromagination because of their spring flair. Most of them are from Wisconsin because I’d be crazy not to highlight local delicacies when designing a cheese board from my home within the dairy state. The board plays with fresh and aged cheeses as well as a fun mix of sheep, goat and cow dairy. The deeply complex Cave Aged Chandoka from LaClare Family Creamery sits alongside the young and creamy Petit Nuage from Landmark Creamery and the buttery, washed-rind Meadow Melody from the small and enchanting Hidden Springs Creamy (who happen to also make my favorite fresh sheep milk cheese in the state). I always need a little funk on my cheeseboard so I added Hook’s Barneveld Blue which is made with goat milk and subtly fragrant. The Humboldt Fog Dill Remix from Cypress Grove was also essential as no cheeseboard of mine can go without something soft-ripened in a bloomy rind; the dill featured in this seasonal classic out of Arcata, California made it too perfect to be ignored. Now if that’s all way over your head and you don’t know one thing about cheese you can still have fun with this for Easter. 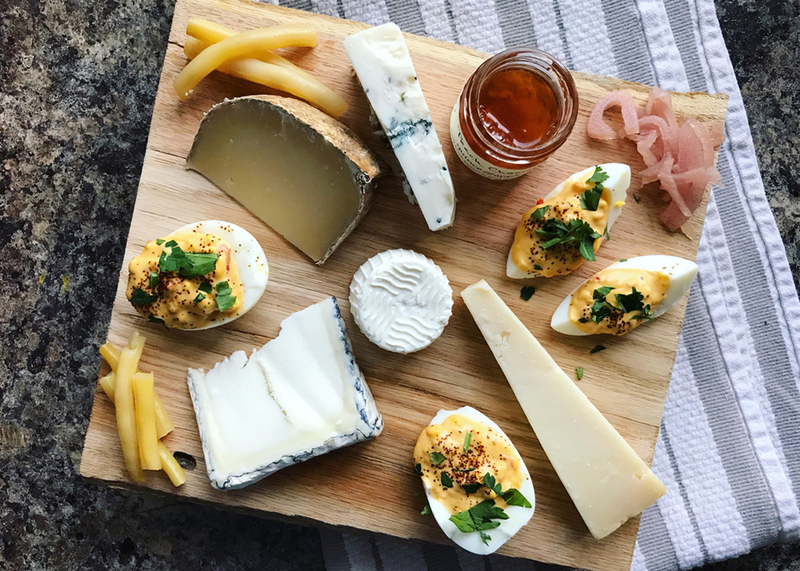 Simply pick your three favorite cheeses (one aged, one firm and one soft is a good rule of thumb) and pair them with some bright spring jam, a jar of pickled green beans, a dozen or so Pimento Cheese Deviled Eggs (recipe below) and delicate herb-infused crackers. This post was generously sponsored by the great folks at Fromagination in Madison. This entry was posted by Kyle Richmond in News & Announcements and tagged board, Wisconsin Cheese Blog. ← More World Championship Cheese!